Sitting at a pavement café as the sun warms your back, you think briefly about moving on to the museum. But the sounds of Strauss drift across from the busking string quartet and it seems simpler just to order another round of coffee and cake and let the world pass by a little longer. The museum can wait. In Viena they’d say you were gemütlich – relaxed and easygoing, with time for the good things in life. Not like the foreign visitors chasing around in the summer heat from Spanish Riding School to cathedral to palace and back again. Sit down awhile and put your feet up: Vienna is more than a flawless boys’ choir and a regimented parade of Lippizaner horses. Vienna has a surprisingly laidback soul. Take the institution that is the Kaffeehaus, or café. Everyone calls in at some point for a chat, or to read the paper, or to chew the intellectual fat. It’s considered part and parcel of the Viennese working day rather than a decadent luxury – a moment of reflection or a quick political debate and then off to perfect your latest work, just like those erstwhile café patrons in Vienna, Schubert, Schumann, Beethoven, Trotsky and Freud. And when it was impratical for a customer to come to the café, the café came to them. Emperor Franz Josef so liked the cakes and sorbets at the Konditorei Demel that he had them delivered through an underground tunnel to the Hofburg palace. This pleasing informality pervades much of the city, and there are countless occasions when Vienna seduces visitors with the unexpected. During the day St Stephen’s Cathedral is a hive of activity as people cram into the small elevator that climbs the 200-foot tower for unparalleled views across the city. But don’t rush straight off to the next stop: search around inside for the idiosyncratic Baroque pulpit, whose handrail features an advancing line of carved stone frogs; or come back at midnight when, outside on the flagstones, skateboarders glide niftily between the horse-drawn carriages. At the Hofburg, the palatial city home of the Hapsburgs, there’s virtually no end to the number of echoing, formal rooms in which the Imperial family lived out their equally formal lives. But even here, a spark of offbeat Viennese character shines through – Franz Josef’s wife, Cissie, had hoops hung from the doorjambs and climbing bars attached to the walls so that she could keep fit between the endless round of cakes and parties. And what parties they must have been if the extraordinary gold, silver and porcelain collections are anything to go by. The Hofburg’s twelve kitchens were kept busy 24 hours a day, churning out culinary delights of Imperial complexity – not only are there gilded tea sets, silver cake stands and cut-glass punch bowls by the score, but assorted bird skewers, marrow extractors, oyster knives and century-old napkins folded like peacocks. 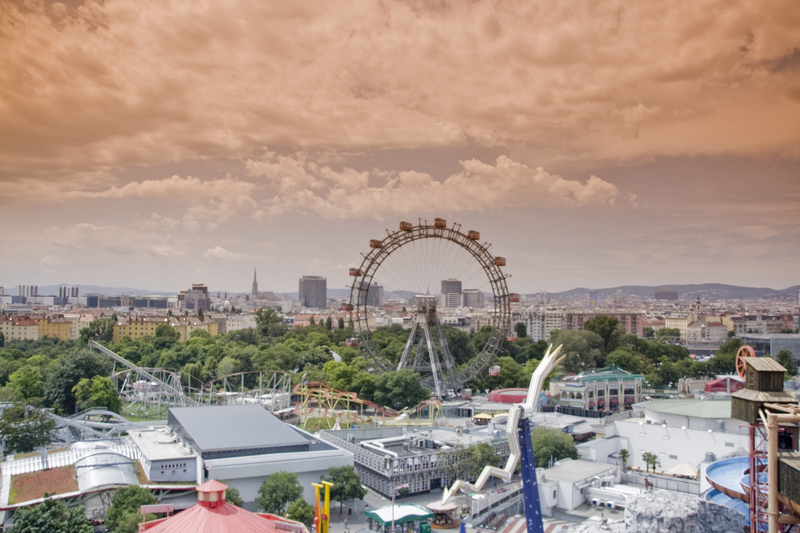 Glamorous picnics were also held at the Prater, the former royal hunting grounds, which now comprise extensive parkland and the city’s renowned funfair – famously home to the Riesenrad, or giant Ferris wheel, which played such a memorable role in the classic film of The Third Man. A fine piece of 19th-century British workmanship, the massive wheel revolves slowly, with the glassed-in carriages providing ever-changing views over park and city as they climb to the highest point, 209 feet above the ground. Once upon a time, dashing cavalry officers, to demonstrate their sangfroid, would sit astride their horses on top of the carriage roofs as the wheel turned full circle – doubtless fortified, in the Viennese way, with nothing stronger than coffee and cake. Want more cake in Vienna? Of course you do! Check out my Sachertorte video. Go on, just a wafferr-thin slice. . . Totally agree, I didn’t see one museum when in Vienna a couple of weeks ago and loved my time there!! Yup, just walking around was pretty astounding- such a gorgeous backdrop everywhere you go. Thank you for your tour. I’d like to return to Vienna for a proper look around as I’ve only visited for the day when staying in Bratislava. I’m doing the exact opposite later this summer – staying in Vienna and going to Bratislava for the day! Looking forward to it.